My debut on the radio talking about camper vans took place this week. A BBC researcher found my blog and I was delighted to be invited on to Friday’s ‘Out for the Weekend’ programme, a fairly light-hearted take on outdoor interests and activities. You can listen to the programme on BBC Radio iPlayer (starting at 1 hour 24 to 1 hour 45). A reporter had previously been out to visit Vintage VW Campers in Falkirk to find out all about hiring a classic bay-window campervan. It was great to hear all about ‘Ziggy’, a blue 1973 Westfalia T2, and to particularly hear the sound of that air-cooled engine on the radio. Another campervan owner, Pauline Moore, and I then chatted about what’s like to own a van, how we become owners and how we use our vans. I’ve since been invited out to visit Vintage VW Campers over the summer. 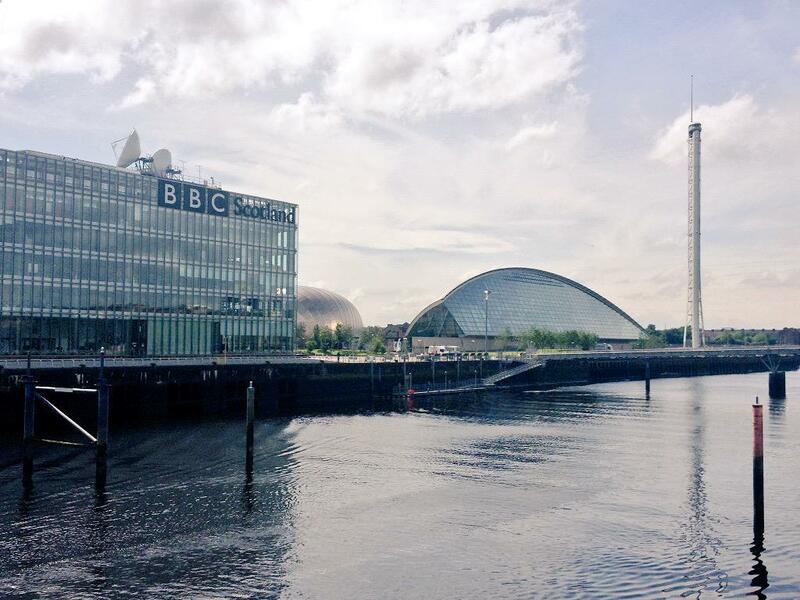 I’d never been to the BBC’s swanky new building at Pacific Quay in Glasgow and wasn’t quite sure what to expect when being interviewed. It turns out that it’s a lot more of an informal process then you might think when you listen to the slick and professional BBC ! ‘Out for the Weekend’ is produced from the BBC’s Aberdeen studio and so Pauline and I were in a completely different studio, with just a brief hello and thanks over the headphones from the producer to ‘top and tail’ the interview. I’m sure there was a ‘plan’ to exactly which segments of the programme would take place … but the person who escorted us into the small studio in Glasgow seemed a little vague and only briefly consulted her little notebook. It’s a wonder that there aren’t more awkward silences on the radio when they cut over to a different studio that happens to be empty ! Anyway, it was a great experience and interesting to see what exactly goes on behind the scenes. My blog’s been a little quiet lately. Quite simply, the reason is that after my mammoth LEJOG cycling trip I’ve taken a little break from outdoor activities and have been catching up with the family, work and a big house improvement project taking place just now. After a month off the bike you’ll be pleased to know that I’ve been enjoying commuting to work too. Thanks, very useful. Have you ever hired a campervan in the States? No I’m afraid I haven’t but would like to at some point. Have you ? I can count on one hand the number of times I would have wanted 4motion. I personally don’t deliberately go off road and 2WD is fine for most campsites in most conditions. So my only concern is being able to stop a 3 tonne van effectively in icy weather. Given winters tend to be pretty mild on the whole (there are just a handful of days where we live each winter where the weather tends to be dicey) I bought winter tyres and I just swap the wheels/tyres over each November and March. I feel more confident in winter having them on. It’s personal choice of course but I think Winter tyres/2WD is perfectly fine – and much cheaper than 4motion.